thanks to the changing weather conditions: We haven't had such a long season for a very long time. As our vehicles were built many years ago and we simply continue to use them, there is only a little CO2 produced to keep them running. The production of a modern vehicle emits far more CO2 than our classics do every year. 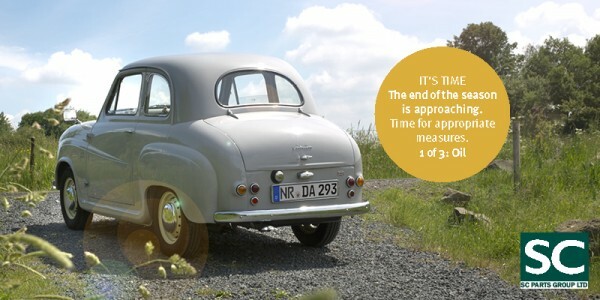 For the further preservation of your classic we recommend some simple actions, we will show the next weeks. When storing the vehicle, allow the engine to warm up well and then change oil and filter. We recommend our absolute bestseller, the mildly alloyed Limora SAE 20W-50. Suitable for all vehicles with oil filter up to the early catalyst era. Excellent quality, 5 litres at an attractive price. Also available as SAE 15W-40 for classic Vauxhalls as well as for air-cooled Volkswagen. 5 ltr. The oil change is important in autumn, i.e. before the winter, because last season's oil has already used up most of its alkaline reserve. Only fresh oil protects the engine from corrosion. The classic Castrol oil does the job perfectly. All in all an excellent oil in a 5 ltr can. Also available in a green 1 ltr can. Perfect for keeping in the boot as stock for refilling. Many manufacturers demanded a high zinc content oil at the time our vehicles were built. With the beginning of the catalyst period, most oils were then changed in formulation to be used in catalyst vehicles. And for our classic vehicles there was no suitable lubricant left. The situation has eased: Classic Q from Duckhams got its intense green colour from the protective zinc complex that was needed for your vehicle at the time. Available again in a 4.5 ltr can. The oil especially for Alfa and Fiat twin cam engines. Eni i-Sint Classic 20W-50 (formerly Agip) is a multigrade engine oil based on highly refined mineral oils for use in powerful four-stroke engines of passenger cars and bikes of Italian manufacturers. The high natural viscosity index guarantees excellent performance even under difficult engine operating conditions. 5 ltr. Now that you have the oil drain plug in your hand, we recommend oil drain valves to make work easier. They allow a quick and clean oilchange. Replace the drain plug with an oil drain valve. Screw in once and you're ready. 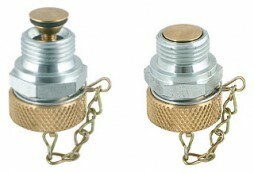 Oil drain valves have a solid steel housing and a brass valve and are manufactured for us in Germany. To change the oil you have to unscrew the cap and put on the drain hose. After the hose is in position, the valve opens and the oil pours out. Put on drain hose and the oil pours out. s Öl läuft sauber ab. 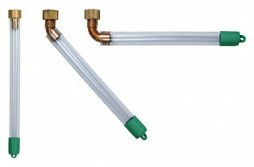 Select the suitable drain hose according to your specific installation situation. All connecting hoses available in three angles and three lengths. Dissolves and removes oil stains, oil grime, greasy and oil-like contaminations, also of mineral or synthetic origin. The consistency ensures long adhesion and effect of the active ingredients. It also works for deep and old oil stains. For all absorbent and non-absorbent surfaces. 750ml. Don't let leaks, drips and spills ruin your day! Our oil binding mat is a poly backed industrial rug that shields and protects garage floors and work surfaces by absorbing fluids without allowing them to penetrate the non-slip poly backing. Garages, sheds, workbenches, shelves and walkways are vulnerable to damage caused by spills and moisture. This mat protect surfaces and save hours of cleaning time. Absorbs up to 4 litres of liquid spills, drips and leaks. available in 5m length as well. Suits even larger vehicles.